With more deer on the road this season, AAA Carolinas is urging motorists to take precaution to avoid collisions. The “rut” season – or mating season – of a deer typically runs from mid-October through mid-November. During this time, it is common for deer to lose their normally cautious manner as bucks chase does, even in the middle of the day. Because of this deviation in behavior, October, November and December are the worst months of the year for motor vehicle collisions with animals. In North Carolina there were 17,901 crashes reported in 2017 from collisions with a deer – with the months of Oct-Dec accounting for 47.5 percent of those crashes, according to the NCDOT. In South Carolina there were 2,460 crashes reported involving deer, according to the SCDPS. Be especially attentive in the early morning and evening hours as many animals (especially deer) are most active from 5-8 a.m. and 5-8 p.m. – prime commuting times for most drivers. Use high beams when there is no oncoming traffic – your lights will often reflect off the animal’s eyes and reveal their location. Watch for water on the side of the road as it often attracts deer. If you spot a deer, slow down and watch for other deer to appear – as they rarely travel alone. As you slow down, blast your horn to frighten the animal away from the road. Check with your insurance agent to make sure you have comprehensive coverage that includes animal collision. Avoid making contact with the deer as a frightened or wounded animal can hurt you or further injure itself. Put your vehicle’s hazard lights on whether it is light or dark out. If possible, move the vehicle to a safe location, out of the road, as you wait for help to arrive. For insurance purposes, call your local law enforcement or highway patrol. To report an injured deer in North Carolina call the NCDNR’s Wildlife Enforcement Division at (800)-662-7137. To report an injured deer in South Carolina call the SCDNR office at (803) 734-3886 to locate a rehabilitator near you. 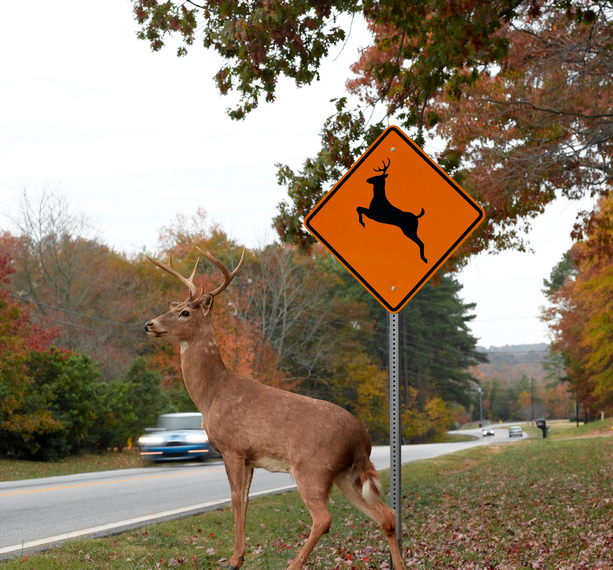 When in North Carolina, vehicle-deer crashes should be reported to the NC Department of Transportation. When in South Carolina, vehicle-deer crashes should be reported to the SC Department of Transportation.